Are you ready for some football?! LTD is! With football season ahead, we have a lot of party-planning to do. If you have a few tailgating parties on the calendar, it might be time to get started on your planning as well. To make it easy, we put together a list of items we think you’d like to have at your football party. Here are this week’s Items We Adore: LTD’s Product Picks for the Week for Tailgate Parties. Mark Your Territory Make a bold statement about your favorite NFL team any time of day or night with this spirited garden flag. Bright fiber-optic lights embedded into the nylon fabric illuminate your team’s logo on one of the sides. Double-sided graphics make sure it reads correctly no matter how you hang it. Included timer automatically turns it on for 8 hours and off for 16 hours. Hidden in a waterproof, fabric-magic pocket, the timer easily sets and resets with the touch of a button. Fits your own standard garden pole. Can be displayed indoors, too. 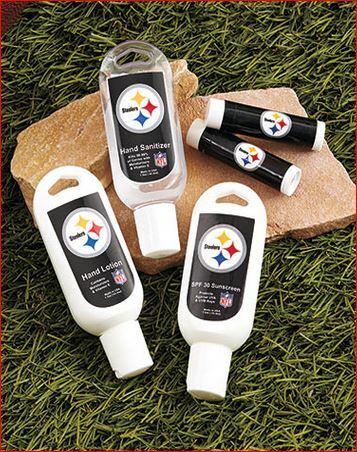 Weather Protection You’ll be prepared for anything when you head to the stadium with an NFL Game Day Skin Care set. It’s a handy collection of items that feature your favorite team’s logo on each bottle or tube. The products are gender neutral so they can be used by both men and women. Bottles have a convenient hanging loop for easy attachment to backpacks, belt loops, and more. Brisk Beverages Keep your drink cold while you enjoy it with a Collegiate Freezable Can Cooler. It features your favorite NCAA team’s colors and has the logo prominently displayed on the front. 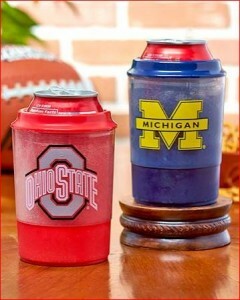 Each lightweight cooler has water inside it that, when frozen, helps your beverage stay ice cold. Fits snugly around the can and has a rubberized plastic bottom so it won’t slip or scratch surfaces. 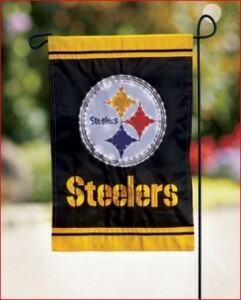 Spirited Scarves Show your team spirit with an officially licensed NFL Reversible Infinity Scarf. This reversible scarf features both team colors, one on each side. Prominently adorning each side is a bold square patch of the team name and logo. 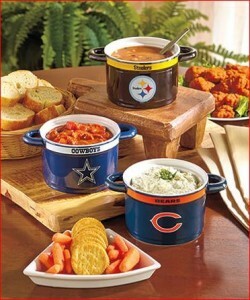 Bowl Backing NFL Gameday Sculpted Bowl is the only way to serve up chili, soup or dip at your party! Durable 23-oz. bowl has raised details on the exterior with your team’s logo on each side and a glazed finish. Double handles make it easy to carry. Ceramic. Dishwasher and microwave safe. Football is another excuse to throw a party and we love parties at LTD! From holiday cocktail parties to celebrating in stadium parking lots, look to LTD to make your fall parties fabulous. Tsk. Tsk. No Buffalo Bills. Ever. For shame. 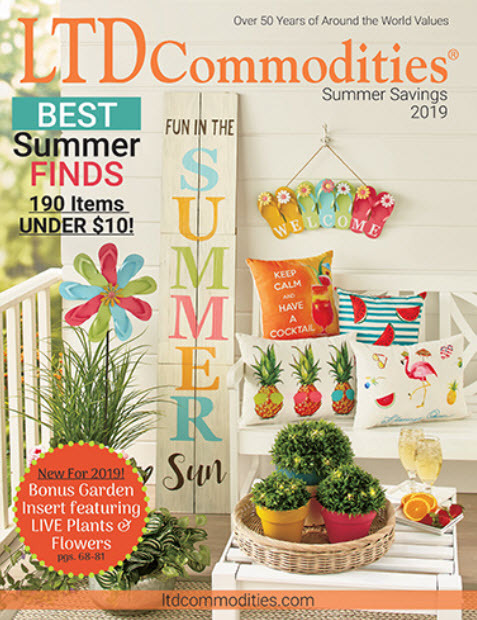 Hi Jennifer – We have one personalized product you might like. Please click here if you’d like to check it out: http://ow.ly/TIxbF. I do apologize that we don’t have a large selection. I’m happy to forward your request to our buyers. Review by S. Kong for Rating: Took awhile to come but got evthreying listed. The screen protector was useless. It had stickers on it which could not be cleanly peeled off. I had to throw that away. The chargers do not work. But the case has a good feel. *UPDATE* Seller contacted me promptly and resent working chargers and screen protector. Would definitely do business again!